The global Bottled Water Market is expected to reach US$307.2 bn by the end of 2024. According to Transparency Market Research, the competitive landscape in the global bottled water market is expected to be dominated by the players currently leading it, including Mountain Valley Spring Company, LLC, PepsiCo Inc., Groupe Danone, and The Coca Cola Company. These are some of the prominent names in the food and beverages industry and hold very strong production capacities and distribution channels around the world. The players in the global bottled water market are also bringing in a consistent rate of innovations in terms of introducing flavored and/or functional bottled water. Their region of focus is also shifting steadily towards emerging economies, where they can take hold of a largely untapped market. 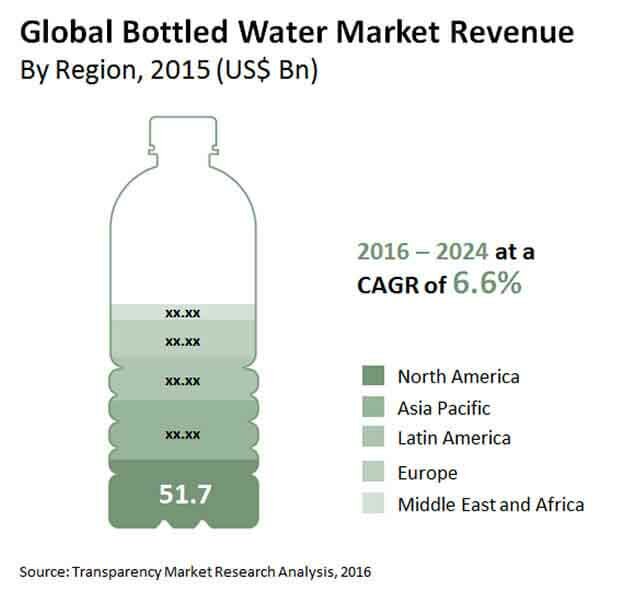 According to the research report released by TMR, the global bottled water market is expected to reach US$307.2 bn by the end of 2024. The market was valued at US$169.9 bn in 2015 and is expected to rise at a CAGR of 6.6% within a forecast period from 2016 to 2024. Still bottled water is expected to continue being the dominant product type in the global bottled water market throughout the forecast period. By the end of 2024, still bottled water is expected to take up 78% of the market. Regionally, the report shows North America and Europe to be in the lead currently, with a swift pace of growth shown by emerging economies from Asia Pacific and Latin America. The Middle East and Africa region is expected to show an especially high rate of growth in the market over the coming years. “Several factors are coming together to boost the overall demand for bottled water in the world. Of these, the primary driver is considered to be the high demand for clean and hygienic drinking water across all regions. The rising rate of global pollution is creating multiple complications in obtaining pure water suitable for drinking in the world. As a result, consumers are demanding for bottled water that is purified through artificial means that can provide a higher level of hygiene than tap water,” states a TMR analyst. The global bottled water market is being pushed further by the growing demand for still bottled water among consumers who are looking for clean water that is caffeine-free, calorie-free, and does not contain any artificial ingredients. Bottled water sales are also being bolstered due to the inception of stricter regulations regarding the use of chemicals and maintaining sugar levels in carbonated and non-carbonated drinks, which are showing a steady rate of decline in demand. The market is also being driven by the increasing amount of disposable incomes present among individuals from emerging economies, where a large number of leading players are beginning to set up manufacturing facilities. One of the key factors restraining the global bottled water market currently, is the increasing amount of criticism that players are facing due to the use of non-degradable materials for packaging, as well as consuming very high amounts of energy for the extraction, purification and processing, and packaging of water. Both factors have led to the formation of several environment protective bodies that are battling the growing use of natural water resources and the increasing generation of plastic waste.